True Tales of People Who Just Can't Take It Anymore. What can you do when the world is pushing you over the edge? More than you think. For some of us, it's the automated voice that answers the phone when we'd rather talk to a real person. For others, it's the fact that Starbucks insists on calling its smallest-sized coffee 'tall.' Or perhaps it's those pesky subscription cards that fall out of magazines. Whatever it is, each of us finds some aspect of everyday life to be particularly maddening, and we often long to lash out at these stubborn irritants of modern life. 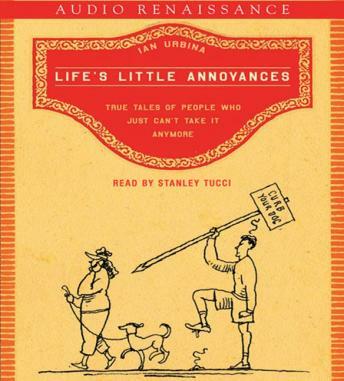 In Life's Little Annoyances Ian Urbina chronicles the lengths to which some people will go when they have endured their pet peeves long enough. We meet the junk-mail recipient who returns unwanted 'business reply' envelopes weighted down with sheet metal, so the mailers will have to pay the postage, and the woman, fed up with the colleague who kept helping himself to her lunch cookies, who replaces them with dog biscuits that look like biscotti. And we revel in the seemingly endless number of tactics people use to vent their anger at telemarketers, loud cellphone talkers, spammers, and others who impose themselves on us. A compendium of human inventiveness, this audiobook will provide comfort and inspiration to anyone who has ever gritted his teeth and dreamed of sweet retribution against the slings and arrows of outrageous people.